This is the celebration of sacrifice which comes two months and ten days after ‘Eid al-Fitr. Muslims celebrate the sacrifice of the lamb in place of Ishmael (Isma’il) by his father, Abraham. On this day, after Salat al-‘Eid (the prescribed ‘Eid prayers), Muslims sacrifice an animal: a ram, goat, sheep, cow or camel. The meat is divided into three parts: one part is distributed among the poor and needy, one part is distributed among relatives and friends and one part is used by the family. This is also a major holiday for Muslims to visit each other and give gifts to the children. ‘Eid al-Adha is celebrated on the 10th of Dhul Hijja, the 12th month of the Islamic lunar calendar, and again depends upon the crescent sighting for the first of the month. For those people who have gone to Makkah for Hajj (the pilgrimage), staying in the Plain of Arafat on the 9th of Dhul Hijja is the most important event. However, for those not performing Hajj, ‘Eid al-Adha is the 10th of Dhul Hijja and one of the two most important celebrations of the year. In the Arabian Peninsula the calendar follows the local crescent sighting criterion, whereas in the U.S., the local crescent sighting is used for the determination of dates. 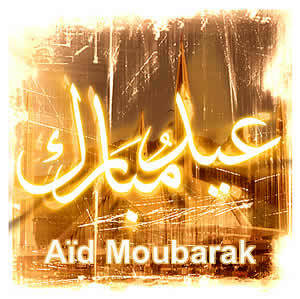 Eid al-Adha may be celebrated for four days from the 10th to the 13th of Dhul Hijja.